Sleep Studio’s exclusive new ViscO2 memory foam combined with ventilation provides the perfect balance of support, comfort and temperature. 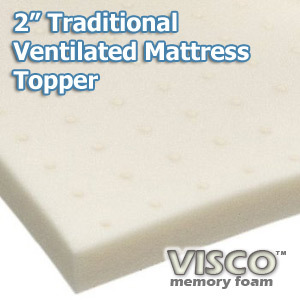 ViscO2 is a breakthrough in memory foam technology with the same performance as the leading brand, but with 5 times greater airflow to prevent overheating. Sleep Studio then adds 3 zones of air channels to allow even more air circulation at the head and feet and more support in the torso area. ViscO2 + ventilation = more oxygen (O2) under the covers for a healthier, more comfortable night’s sleep. Unlike other leading memory foams, ViscO2 returns to its original size faster and is not prone to permanent shrinkage from compression. Ultra fresh anti microbial/anti bacterial treatment is also added.